I have decided to paint a “Bend Dog” Series. It’s a culture in Bend, Oregon, to have a dog, to display the dog, and to treat the dog…well…let’s say very nicely (see “Snoozin”, to get an idea of the type of luxury dogs have around here). A couple of months ago, I was approached by the owner of a future store in downtown Bend. A new store focusing on dogs. That’s nothing new, you say? But wait! This shop is about dogs, yes, but dogs and ART! Her shop, called Bendy Dog, right downtown in Bend, Oregon, will be opening soon. I signed on, and am currently working on a series to go in the shop. 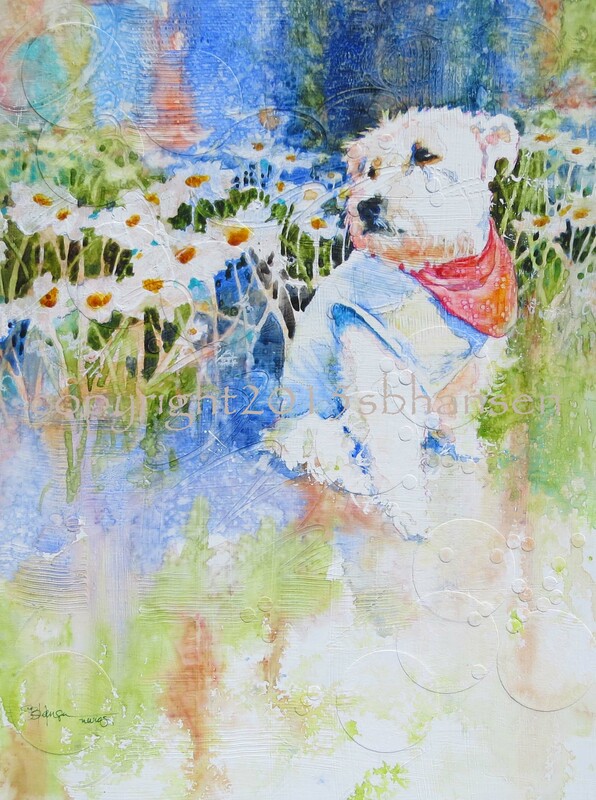 She will have greeting cards, prints, metal art, fabric art, soap products, and other doggy items from various artists and businesses. There is no shortage of dog-photo opportunities here in Bend. Anywhere you go, you will see dogs with people, dogs with dogs, dogs doing doggy things and dogs doing people things. In fact, as I drove to the grocery store today, I sat waiting in the left-hand turn lane. In the lane opposite me, a couple rode bikes towards town. Okay, no big deal, right? BUT, I say, BUT!! The man had his little dog IN A BACKPACK on his back as he biked. Really?! Unfortunately, I was headed in the opposite direction and couldn’t take a photo for my series! I’ll think of it forever. However, there is a chance that I’ll run into them again, with my camera, and going in the same direction! 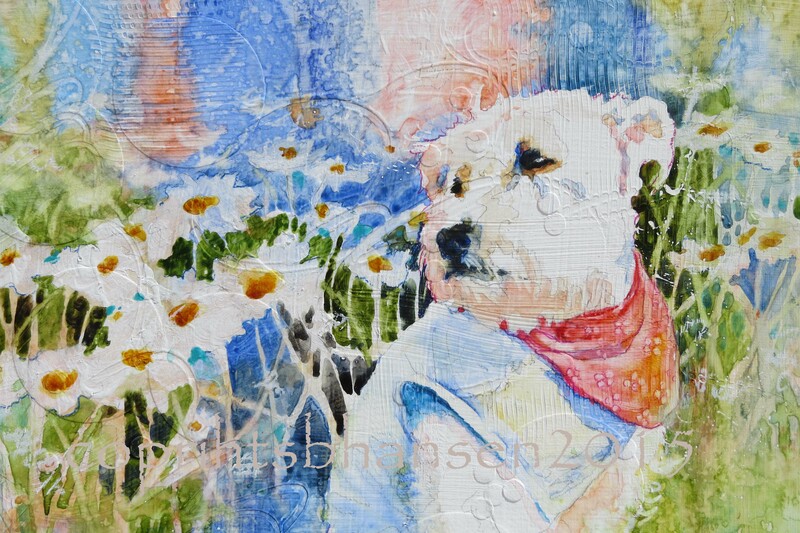 For this week’s painting, I began with a cute photo of a white dog modeling a scarf and a shirt(?). 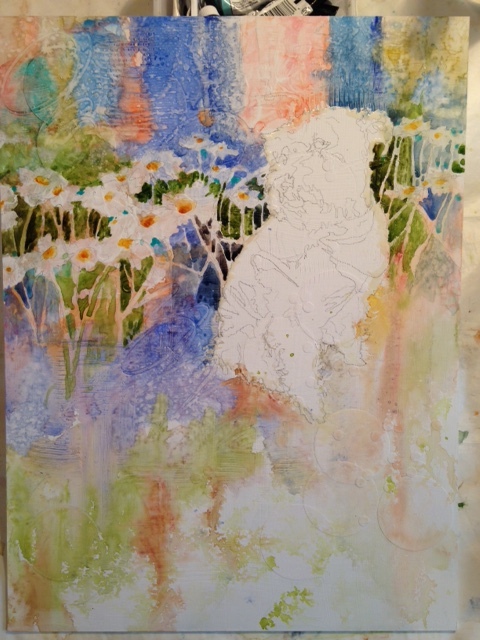 Daisies became the natural choice for the background. They grow in profusion here in Bend in the summer, especially downtown. 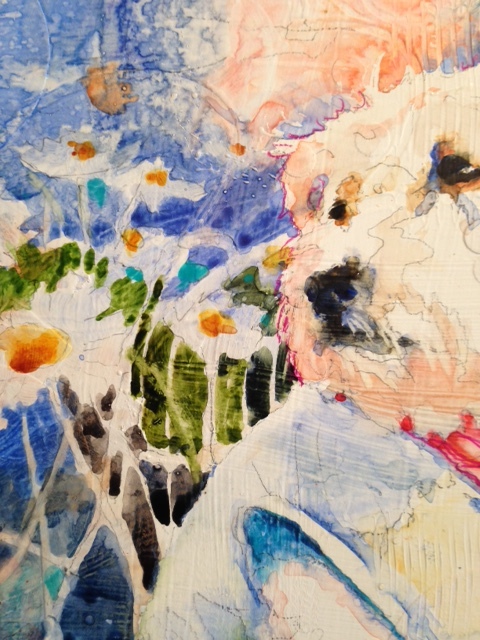 I imagined the whites of the flowers playing off her fur, and adding structure and cheer to the painting. Placing the dog in the upper RH third of the painting, I began an off-center “T”, or “cross” composition by using dark values and directional lines, drawing the eye towards the subject. I wanted a vertical suggestion of buildings in the background, a downtown effect. 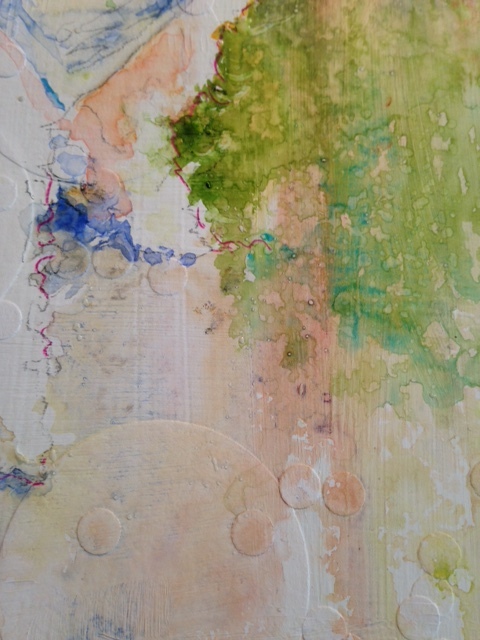 In the foreground, I dripped and sprayed water and paint, fading out to white in the lower RH corner, adding a diagonal line towards our subject. You can see collages of circles detailed in the photo above. Circles represent carefree and childlike joy, and further support the theme. Her front feet fade out into the whites and splashes of the foreground, giving the painting an open feel and an interesting place to rest the eye. You can also see where I have added a contrasting line element to her front legs to define it further. The line is dark pink to play off the light green foliage of her surroundings. Above, the detail of Daisy’s face shows the warm shadows against the flower background. I worked on adding detail to her scarf, finished out her fur and shirt, and used watercolor pencils to add a line element to various areas of the painting. After studying the painting from a distance, I felt she disappeared a bit and that the background behind her came forward with too light a value and too warm a hue. I decided to darken a cool-colored “doorway” directly behind her. “Daisy Downtown” is a success! The layout worked perfectly for the theme, as well as the colors and daisy background. So cheerful. So cute. She needs a home and a place to hang! She would brighten any room in your house. To purchase, send me an comment. I accept PayPal and will email a PayPal invoice. Shipping extra. Prints available, sizes starting at 8×10 for $25. Please check back often, I’m working on an Etsy site for prints and should have it up soon. This painting will also be on Etsy hopefully by this weekend! My site is coming along!